It might be possible to treat the main cause of permanent blindness before people notice any loss of vision, say University College London researchers. They have developed a new kind of eye exam that might spot glaucoma a decade before symptoms appear. It uses a fluorescent dye that sticks to the cells in the retina that are about to die. But it has been tested on just 16 people in safety trials and far more research is needed, the study says. Glaucoma affects 60 million people around the world and most have lost a third of their vision by the time they are diagnosed. The disease is usually caused by changes to the pressure inside the eye that kills the retina’s nerve cells. As these cells become stressed and sickly, they start to change their chemistry and more fatty structures move to the outside of the cell. This is what the fluorescent dye, which is injected into the bloodstream, sticks to. Then all an optician has to do is look at the back of the eye and if the retina is illuminated in white fluorescent dots then the patient has a problem. In Phase I clinical trials – the earliest form of trial designed to check new treatments are safe – the technique could spot the difference between they eyes of healthy patients and those with glaucoma. 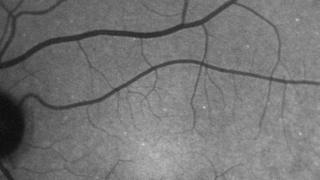 Prof Francesca Cordeiro, from the UCL Institute of Ophthalmology, told the BBC News website: “For the first time in humans we have a test that identifies [glaucoma] disease activity before the disease develops. Current treatments to control the eye’s internal pressure can stop or slow down the progression of the disease, although they cannot reverse the damage already done. UCL’s study, published in the journal Brain, says more research is “clearly needed”. The eye is not only a window on the soul it is a window on the brain. Animal research suggests neurodegenerative diseases might be visible in the decay of nerve cells – which anatomically are simply an extension of the brain – too. An eye exam would be a cheap way of monitoring the progression of diseases like dementia, Parkinson’s or multiple sclerosis than a brain scan. Bethan Hughes, from the Wellcome Trust, which funded the research, said: “This innovation has the potential to transform lives for those who suffer loss of sight through glaucoma, and offers hope of a breakthrough in early diagnosis of other neurodegenerative diseases.